This sturdy, reliable building from Waltons provides a practical, yet stylish storage solution. Constructed with Shiplap tongue and groove cladding, the shed benefits from a traditional design apex roof. This doesn’t just add aesthetic appeal to the building; it also provides exceptional protection against the rain. Covered with heavy duty sand felt, it is also protected against potential damage caused by debris. 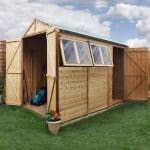 This shed does come with windows and they benefit from 2.5mm styrene glazing. This is often used as an alternative to glass due to its additional strength and safety. Bearers are provided to help keep the base of the building off the ground; helping to protect against rot and damp. Waltons even give you a 10 year anti-rot guarantee, though there are terms and conditions to this that you should be aware of. 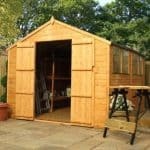 For example, before you are covered by the warranty you will need to treat the shed with a good quality preservative. Its double doors are equipped with a Rim lock for added security. They also benefit from a sturdy ledge design which provides space to install a hasp and staple, as well as ensuring the doors don’t sag over the years. All in all it is a high quality, reliable shed that is perfect for general outdoor storage. The unpainted design won’t be to everyone’s taste. However, a quick coat of paint once it’s been treated, or a coloured treatment, will easily fix this problem. 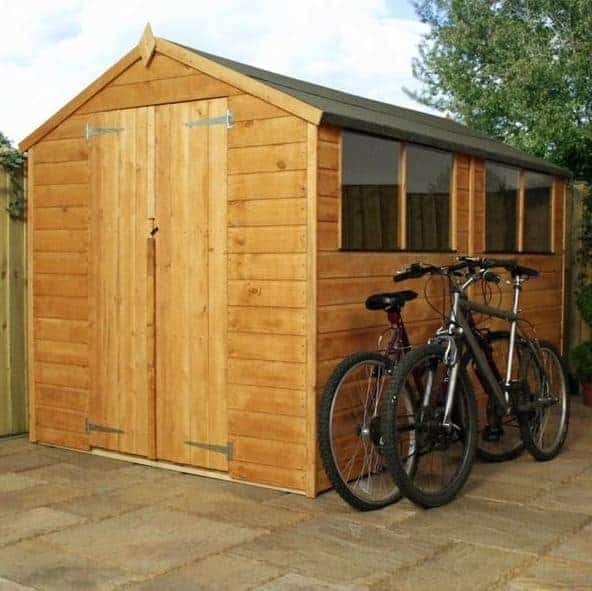 With a tough design, this big wooden storage shed is one of the highest quality models available from Waltons. Benefitting from a popular apex roof design, the building has excellent element protection all year round. It also gives a great amount of head space inside the shed thanks to the unique upside down V shape. This provides both additional comfort and storage space. As with all of their sheds, Waltons have also covered this one with a heavy duty sand felt. This further protects the roof against rainfall and helps to stop any damp related problems occurring throughout the seasons. The roof measures a generous 2.07m high and its eaves stand at 1.58m tall. The doors have also been designed to ensure you have plenty of space to enter the building, measuring 1.68m tall and 0.96m wide. As it is a large building, you’ll find it measures 3.01m deep and 1.90m wide. This makes it suitable for medium sized gardens. One of the main highlights of this shed is the fact it has been built with Shiplap tongue and groove cladding. You’ll discover different manufacturers use a different thickness and this one uses a more standard 12mm thick cladding. However, there’s nothing standard about its strength. It actually provides more storage options as the thickness of the timber makes it strong enough to support interior shelves. You could also hang heavy equipment on hooks inside the building if you need to. So this alone is a major advantage. 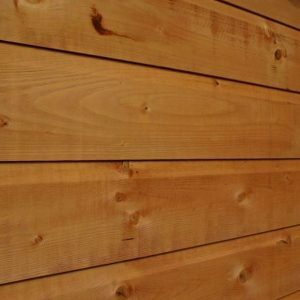 With Shiplap cladding, the main notable difference is that the boards have a small groove built into them. This is a subtle detail, yet it provides exceptional water resistance. Rainwater will run down the groove, away from the building, helping to give it a superior level of water resistance. It isn’t just the practical benefits that make this type of cladding so popular either. You’ll also see that it has a very attractive design. The frame is pretty standard as it measures 28mm x 28mm. This is what you’ll find featured on most Walton’s outdoor buildings. The corners have been double framed for extra stability however. The only thing we are slightly disappointed with is the fact the Shiplap tongue and groove cladding isn’t followed through to the floor. Instead you are supplied with a 10mm solid sheet material. Now don’t get us wrong, this does provide a good amount of strength. However, we don’t feel it’s suitable for heavy storage. The manufacturer does make up for this by supplying a free 28mm floor support kit. So we like that you don’t necessarily have to spend any extra money to improve the floor’s support. However, for absolute peace of mind we do recommend upgrading to the extra strength floor support pack. This is designed to hold really heavy equipment and machinery. The majority of sheds require regular treatments and this is no exception. As always, we recommend using a spirit based preservative. Now the thing about spirit based treatments is that although they are more expensive to purchase than water treatments, they don’t always have to be reapplied every year. You will need to check with the treatment instructions, but it is possible you could end up saving money and time if you don’t need to apply them yearly. It isn’t just time and hassle you’ll save either. Spirit treatments work in a unique way to ensure the entire timber is protected, not just the surface. It does this by penetrating inside the wood, forming an interior barrier, as well as a barrier on the surface. So as well as the great natural water-resistant qualities the shed provides from its Shiplap cladding, the treatment will further boost its rainwater protection, ensuring the shed lasts a lot longer. 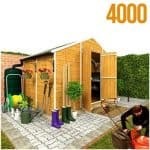 Waltons provide a 10 year anti-rot warranty with this shed, though you do need to maintain regular treatments to qualify. As stated on the site, they have treated this shed with a water based timber, but it is designed purely to protect it during transit. So you will need to apply another treatment either before you build the shed or afterwards. We like the thickness of the double doors supplied with this shed. The ledge feature offers a more stable, strong design. It also supports the installation of a hasp and staple. As you would expect, they open out to provide brilliant access into the building, ensuring you never have to struggle to transfer bulky, large equipment. We also like that four 2.5mm styrene glazed windows have been added to the building. This not only gives it a more attractive appearance, but it also provides natural lighting. Styrene is a type of plastic that benefits from being completely shatterproof. It is a lot safer than glass which is a particularly good feature if you have young children. The windows are fixed so they won’t provide any ventilation. It is worth noting that the picture shows six windows, rather than four. These don’t come as standard, though you can add them as a customisation extra if you contact the manufacturer. There is no lock included with this building so that is something we recommend you invest in. 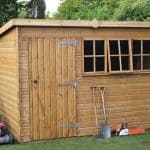 The cladding makes the shed difficult to break through, but if there isn’t a lock a thief could just walk right in and take whatever they wanted. It also doesn’t have the most secure design due to the windows included. However, this is easily rectifiable if you put up curtains or blinds. As they are fixed, you also don’t need to worry about thieves opening them and getting inside that way. So whilst they do limit privacy, they do add some level of security. One thing Waltons do tend to provide is a lot of extras and customisation options. With this shed you have plenty of options open to you. There’s the standard upgrades that you’ll find with most sheds including the superior duty felt. Made from glass fibres, this self-adhesive felt will not perish over time and it adds great moisture-protection benefits. You also get a choice of either green or charcoal coloured felt. Then there’s the extra strength support pack for the floor. You are given a 28mm floor support pack which you may find perfectly suits your storage needs. However, the extra strength pack is advised to anyone looking at storing heavy machinery or boxes. Supplied in 2350mm lengths, the joists simply slot into floor, making them very simple to install. A unique feature Waltons provides with the majority of its windowed buildings, is the choice of whether to assemble them on the right or left hand side of the shed. This may sound like an irrelevant feature, but it can actually add to the security of the building if you install them on the side that is least open to the public. The 10×6 Portabase is something we do recommend. 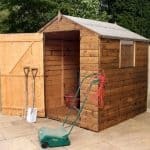 Offering an ideal base to build the shed on top of, it can make installation a lot quicker as well as easier. 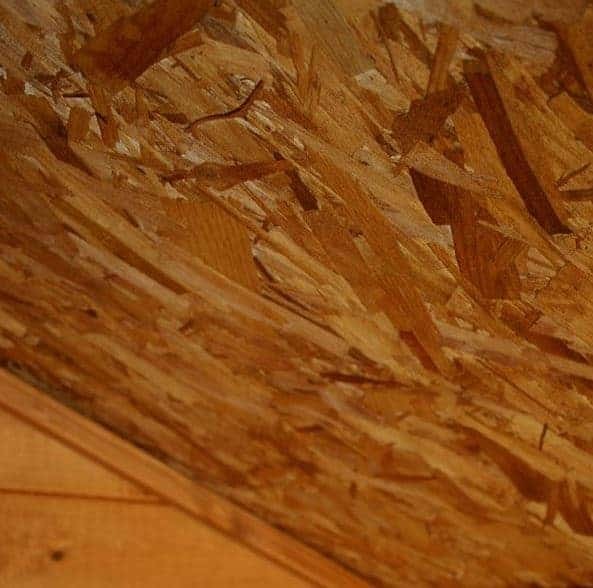 It will also help to further protect it from rot and ensure it has an overall more stable structure. If you think you’ll need more storage space than what the floor provides, the 3ft, 4ft and 5ft shelving kits are worth considering. Made from exceptional 16mm tongue and groove cladding, these aren’t your standard shelving units. They are designed to hold very heavy items and will really withstand the test of time. You can also choose from double or triple tier shelving. Out of the other extras available, the only other one we really recommend is the 49mm weatherproof padlock with hasp and staple. 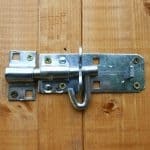 It is one of the best quality locks we’ve come across and it offers double locking for ultimate security. 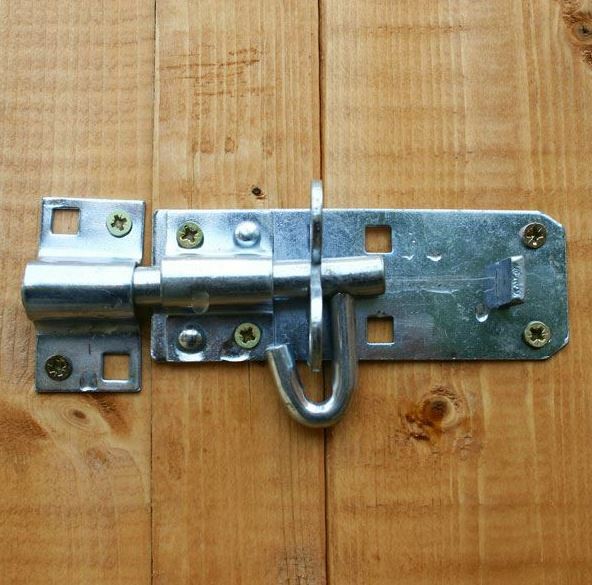 It’s hard to believe this sturdy, weatherproof lock is just £9.99. We can’t really fault the quality of this shed. The only thing that stopped us giving it full ratings is the floor. If the tongue and groove Shiplap cladding had been included in the roof and floor it would have definitely received 10/10. The timber used to create the shed is naturally weather-resistant and therefore incredibly durable. However, in order to preserve the building and ensure it lasts for years to come, you do need to carry out yearly treatments. Again, the only thing stopping us from giving a 10/10 rating is the floor. As it isn’t suitable for storing heavier equipment, you would need to upgrade to get the full benefits. However, we like that the cladding supports shelving and the amount of space provided, along with the extra height. It really does give you a great level of storage space. The assembly is simple, but it does take a long time to build. With 2 people you can expect it to take a full day. 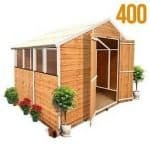 While the shed does provide excellent value for money, we have taken into account the few extras you will likely need to invest in. There’s also the yearly treatments to add to the cost. Overall though it is a great value shed. 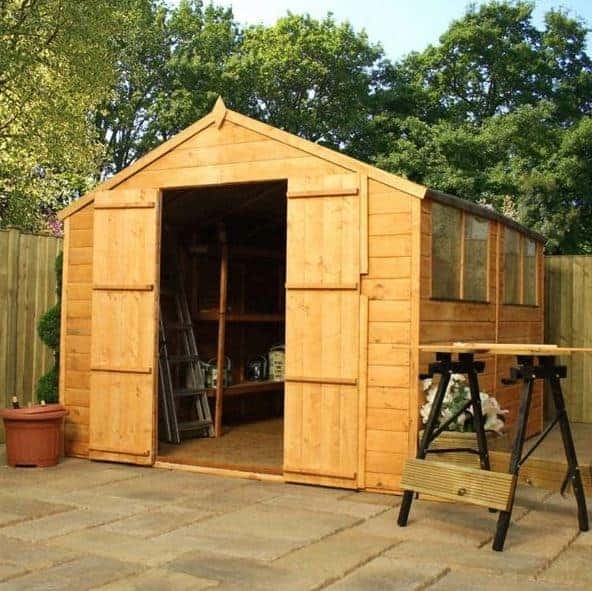 Final Thoughts: There are many features that make this shed a fantastic investment. 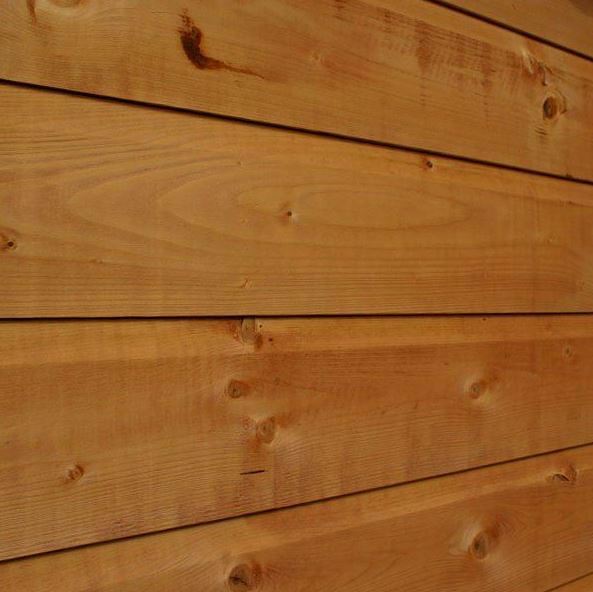 The Shiplap tongue and groove construction ensures an incredibly stable and secure structure. The fact you also receive great interior height is also an advantage thanks to the stylish and practical apex roof. It is designed to be extremely water-resistant and the strength of the cladding increases its storage potential; enabling you to add shelving and hooks. We like that Waltons provide a free floor support kit as it can save you a lot of money if you find the solid sheet materials aren’t strong enough to support your equipment.